For many members of the chattering classes Jesus is a Lenin figure, or Lenin is a Jesus figure (depending on your priorities) with the difference that Lenin was a real historical figure, while Jesus was not. A recent interview with Salman Rushdie conducted by the ABC, (note the "the" before ABC, meaning the Australian Broadcasting Corporation, not the American Broadcasting Corporation) typifies this view of Jesus held by his cultured despisers. Divided into three cantos, “VI Lenin” tells the story of the triumph of the proletarian revolution through the vehicle of the working class, which through toil and strife, guided by the laws of social development, revealed by its ideological genius Karl Marx, produces the “twin of Mother History” -- the Bolshevik Party and its leader, VI Lenin. appears the compass of Leninist thought, appears the guiding hand of Lenin. And even the death of Ilyich became a great communist organizer. Proletarians, form ranks for the last battle! Straighten your backs, unbend your knees! Proletarian army, close ranks! Long live the joyous revolution, soon to come! This is the greatest of all great fights that history has known. What prompted that bit of showing off of the detritus of a wasted youth was the Salman Rushdie interview broadcast on the ABC Radio National program Books and Arts Daily. In a forty minute segment entitled "Salman Rushdie's New Memoir: Joseph Anton" host Michael Cathcart spoke to the British novelist about his life in the wake of the fatwah. On Valentine's Day in 1989, Iran's Supreme leader the Ayatollah Khomeini declared a fatwa - any believer who assassinated the novelist Salman Rushdie was promised eternal life. The Ayatollah announced that the Indian born British novelist had committed an unpardonable blasphemy against Islam in a novel called The Satanic Verses. To supporters of the fatwa, even the title must have seemed like a confession. This was a man who by his own declaration was the author of The Satanic Verses. And so Salman Rushdie winner of the Booker prize became Rushdie the Infidel. Rushdie the man in hiding. For some he became a champion of free speech, a man who refused to cave in to bullying. To others, he was the author of his own misfortune. Now he tells the story of his years in protection in a memoir, a vast book called Joseph Anton, the alias he took while in hiding. I encourage you to listen to the interview. Rushdie tells a fascinating story about his life and his work -- and also has insights in the present unrest spreading across the Muslim world. 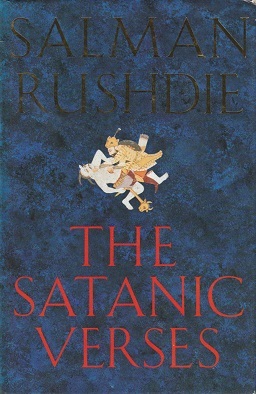 In recounting the protests that followed the publication of The Satanic Verses Rushdie states the "people who had demonstrated were ordered to demonstrate." "They didn't know anything" about his book and were out in the streets demonstrating against a Western provocation against Islam on the instructions of political leaders who wanted to capitalize on the book's notoriety for their local political advantage. The same pattern of events was unfolding in the Muslim world, Rushdie argued, with the obscure YouTube video "Innocence of Muslims." This interpretation of events is in line with the reports I shared from my contacts in Egypt on 11 Sept 2012 when a mob attacked the U.S. embassy in Cairo and consulate in Benghazi. While the government on 28 Sept backed away from its claim the attack on Benghazi was caused by spontaneous outrage from the "Innocence of Muslims" film, I have yet to see them concede what the press and Egyptian government have concluded -- that the Cairo riot was a staged provocation also. The ABC interviewer, were he to posit the existence of Jesus, would describe him in these terms also -- and view the Christian religion in terms of its social utility. Let me say my concern is not to argue theology, but to point out the worldview the interviewer used in expressing what he believed to be the consensus as to who Jesus was. Jesus like Lenin was a figure whose value lay in his symbolic utility. It is how Jesus is interpreted, not who he is or his work that matters. This, of course, is contrary to most Christian traditions, save for a few modern sects -- yet the palette the ABC uses to paint who Jesus was is a default left-liberal semi-universalist one. Doubts can be raised about Jesus, but the portrait of Muhammad is the one held by traditional Islam.